Remember when you were a kid and the giant golden arches outside every McDonald's proudly proclaimed how many customers they had served since the beginning of time? Wasn't it fun watching the number go up every so often and getting a special feeling knowing you had contributed in a small way to that number? Then, one day, they just stopped counting, for seemingly no reason at all, and the whole thing raised a lot of questions. What exactly were they counting, and how did they get that number? Why did they stop? What would the number be today if they had continued? This site intends to answer all those questions and more. But most importantly, it is supposed to give people that wish they would keep counting, a refuge. Although the number may not be calculated in exactly the same way that Ray Kroc did it so many years ago, and while it would of course be better ifMcDonald's posted the number on all their signs once again, this site can still take us part of the way back to those days of yesteryear. I will take the newly released monthly systemwide sales growth % and multiply it times the hamburger sales of that same month in the previous year, then i will add that number to the overall total hamburger sales count. 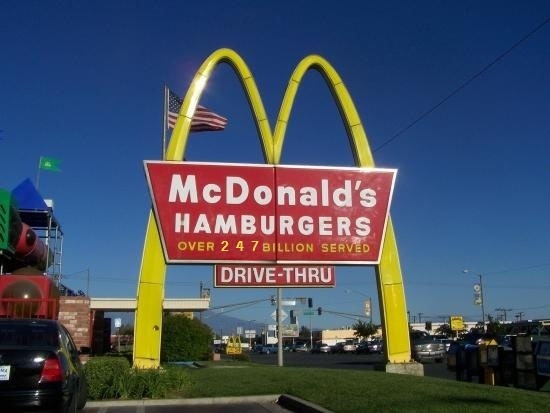 I first had to assume that McDonald's has always done an accurate calculation in the past of it's total hamburgers served, so when they reached 80 Billion in 1990 and 100 Billion in 1994 (see post on Hamburger Sign Milestones) I believed them. So now I knew that in the 4 years between 1990 and 1994 they had sold roughly 20 Billion Hamburgers, at an average of 5 Billion Per year during that period. (20 Billion/4 Years)= 5 Billion Per year. As are result I now knew that in the final year of them counting 1994 they sold about 5 Billion hamburgers. So, I first needed to figure out how many hamburgers had been sold between 1994 and the end of 2009 on a yearly basis. So I needed to figure out what % growth number put out by McDonald's would be closest to the hamburger sales number they had used since the beginning but no longer calculated. I decided the best number to use is a number put out by McDonald's on a monthly basis as well as yearly in their annual report. The number I decided most closely tracked the increase in hamburgers sales was called "Systemwide sales" this number means all the sales of total food McDonald's has sold over the year in all corporate owned and franchised stores, basically every dollar that McDonald's took in from every customer. The company then expresses this systemwide sales number as a % of growth to show how much the systemwide sales has grown since last year. For example on the annual report for 2004 it says that the Systemwide sales increased by 8% since 2003. So all I needed to do, was find the systemwide sales growth rate % Year over Year for every year 1995-2009. So now that knew the sales growth rates per year since 1995 and the fact that in 1994 they sold 5 Billion hamburgers I just needed to apply that % to 5 Billion hamburgers sold in 1994 to get the hamburger sales for each year. An example of the calculation for the 1995 hamburger sales: 5,000,000,000 x (1+12%)= 5,600,000,000 sold in 1995. Then all I had to do was add up all those number for hamburgers sold per year since 1994 giving me: 141,509,336,177 hamburgers sold until dec 31st 2009 since 1994. Then just added that number onto the 100 Billion hamburgers reached when they stopped counting in 1994 to get 241,509,336,177 sold in total until dec 31, 2009. Now I just needed to use the monthly systemwide sales growth numbers put out by McDonald's for January and February 2010. Now these growth numbers refer to the % change in systemwide sales since that same month in 2009. So first I needed to know how many hamburgers were sold in January 2009 so I took the total hamburgers sold for 2009- 14,262,000,490 and divided it by the 12 months of the year giving me roughly 1,188,500,041 sold in January 2009. I then found out the systemwide sales growth % YOY for January 2010 which was 4.3% so I applied that growth % to January 2009: 1,188,500,041 x (1+4.4%)=1,239,605,543 the total hamburger sales for January 2010. Then I did the same calculation for February 2010 when the growth % was 6.4% according to McDonald's: 1,188,500,041 x (1+6.4%)= 1,264,564,044 hamburger sales for february 2010. Note: This calculation assumed that as overall sales at McDonald's increases, hamburger sales increases in direct proportion to those sales, which may or may not be true. (because we no longer have accurate hamburger sales data, systemwide sales growth is a decent replacement) In practice, if during the period of 1994 until today a smaller or larger % of McDonald's overall sales is made up of hamburger sales than during the period between 1990 and 1994 then the total hamburgers sold estimate will be slightly inaccurate. Basically it is assumed that hamburger sales as a % of overall sales has remained constant throughout McDonald's history. Note: McDonald's actually releases two systemwide sales growth numbers on the annual report and monthly reports. One % includes a currency calculation as the chain does business, and the other attempts to exclude the affects of currency fluctions by only using a constant exchange rate for the period being measured, that based on the average exchange rate of the prior period being compared to. For example for the year of 2009 McDonalds released two systemwide sales growth numbers 6% excluding the foreign currency fluctuations and 2.4% including foreign currency fluctions. I always use the number excluding foreign currency fluctuations because I feel it gives a better idea of what the sales have actually been around the world. If I used the systemwide sales including foreign currency fluctuations, then changing exchange rates would have a huge impact on the overall sales around the world, and i wouldn't be able to accurately figure out how many hamburgers have been sold overall. The excluding foreign currency fluctuation number assumes that the exchange rate has been the same during the prior period, it therefore gives a better sense of what the increased sales have been like. McDonald's has said that they use to excluding exchange rate number to evaluate their performance in foreign markets, because changing exchange rates can have a huge impact on sales numbers.